After spending the last 4 weekends racing (3x 24hour, 1x 100km MTB), my body decided to give me an enforced break in the form of a common cold. So whilst my friends spent 12 hours looking for checkpoints in the allegedly brutally hilly surrounds of Jenolan (about 2.5hrs west of Sydney), I divided my non-sleeping time between drinking copious amounts of tea and thinking up an inspiring challenge. And the challenge arrived. It coincided with elevated heart rate, sweaty palms, occasional dizzy spells. The culprit could have been symptoms of a pretty solid case of a cold, but those are just as easily applicable to the excitement and slight apprehension of realising what I might be signing myself up for. Which is: finding myself a hill and making it my Everest. It doesn’t appear to be that difficult in theory. Just ride up and down a hill, until you’ve climbed the height of Everest. So why on Earth would anyone want to do this? Well…. good question. Firstly, it’s a pretty obscure challenge. There is no prize nor is there any structure outside of the fairly simple rules. Plus there is only one woman to have done it out of 60 “summiteers”. Secondly, after having an absolute ball of a time racing the Convict 100 (a 100km mountain bike race), I have decided that I will need to shave off at least 30, preferably 45minutes of my time. Equating to about 10%, this will be a significant effort. Being able to ride hills easily will definitely help. Thirdly, this excites me. The mindnumbing, leg destroying grind up and down will play massive havoc with my resolve and sanity. I want to push it, I want to challenge myself and I want to confirm that I am learning to love not the count-down, not the recent memory, but the current moment, wherever on the journey that may be. Where better to test it than doing countless laps of something that is lung-bustingly insane?! – we should be able to draw parallels with climbing any steep hill, one step at a time, or conversely, turning something small and obscure into something significant. I’ve reached out to a few other crazy women I know and I have a feeling there will be a few of us. Climbing our own Everests, conquering our own mountains. So I think we can, together, make a step, in whatever way we can, towards inspiring ourselves and others, towards a better future. 1. Which hill? Will it be on road or dirt? 3. Who will join in, whether to grow our numbers stronger or help us achieve our goals? 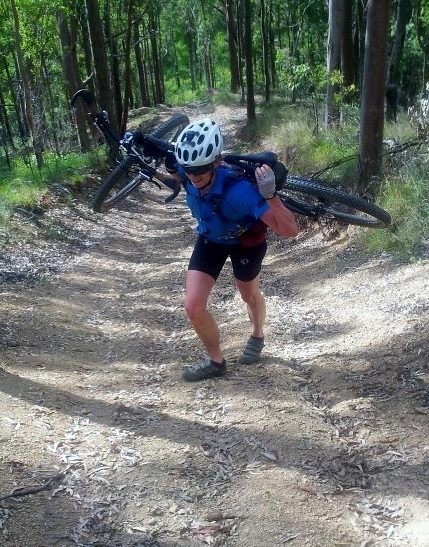 And don’t let that photo mislead you, I’m not allowed to walk and carry my bike up my Everest. My bike will have to carry me all the way.